Mr Tay was admitted to Assisi Hospice in September. The former odd-job worker was single and had two siblings. He was estranged from his brother but his sister visited him once a week. "In home hospice care, as long as there are no reliable caregivers, our patients would not normally pass on alone at home. "We would normally transfer them to a medical facility where the patient can be cared for," said a spokesman for HCA Hospice Care, the largest provider of home hospice care in Singapore. But doctors and nurses are often unable to be there for patients at the moment of death. The first NODA programme was started in the United States by a nurse, Ms Sandra Clarke, at the Sacred Heart Medical Centre in Eugene, Oregon, in 2001. A dying patient had asked her during her ward rounds: "Will you stay with me?" She said she would, after checking on the other patients. When she returned after checking on six other patients, she found him dead. Overcome with guilt and frustration, Ms Clarke started NODA, with hospital employees volunteering their time. It is now a national movement in the US and in countries such as Japan. Assisi began its NODA programme for its hospice patients in 2014, with volunteers serving four patients. Its team of 40 volunteers has since kept vigil for 41 patients. Dover Park Hospice started its programme earlier, in 2013, but has a smaller team of 12 volunteers who keep vigil about five times a year. Volunteers need a certain level of emotional maturity and training. They also need to be highly committed as they are usually activated at short notice. Ms Samantha Lim, 37, a teacher who did a three-hour vigil with Mr Tay the day before he died, said: "After he passed away, we all went down to the carpark and walked him to the van. "There was peace. He was not alone and that thought drives me to do this volunteer work because I know there are many seniors out there who live alone." Why is the NODA programme important? Associate Professor James Low, council member at the Singapore Hospice Council and a senior consultant at Khoo Teck Puat Hospital, said: "To die alone... there is a sense that their death didn't matter to anyone." 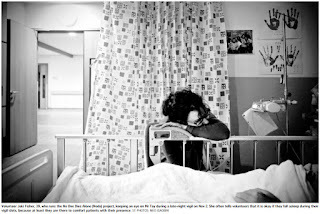 Patients near death can feel lonely even if they are in a hospital or hospice, he noted, adding: "This can happen in the busyness of the ward where so many others are 'crying out' for attention and help." 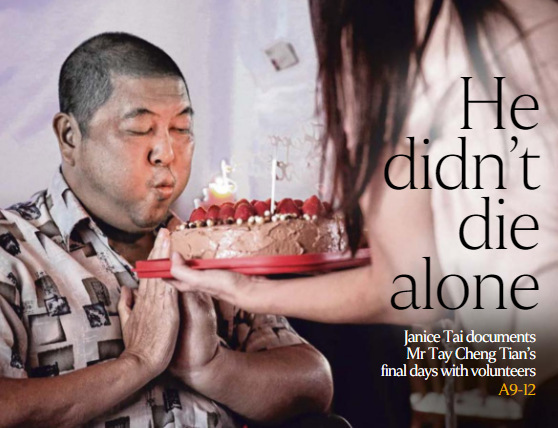 In Mr Tay's case, he preferred to die in the hospice rather than at home. He told The Sunday Times: "Here, I have the company of nurses and volunteers, who have so much love and compassion. That is something money can't buy." Mr Tay Cheng Tian, who had oesophageal cancer, died in a hospice on Nov 4. None of his family members was by his bed when he breathed his last, but the 54-year-old did not die alone. In the last few weeks of his life, a group of strangers befriended him and committed to spending time with him till the very end. At a quarter past noon on Nov 2, a group of 40 volunteers from Assisi Hospice received a text message in their group chat. "He could pass away any time so it's good for us to start the vigil," wrote Ms Jaki Fisher, 39. Ms Fisher, who runs the No One Dies Alone (NODA) programme at the hospice, was referring to 54-year-old Tay Cheng Tian. "I can do 10pm to 1am tonight," texted Ms Fisher as she set in motion the makings of a vigil schedule. In two hours, the "roster" for the round-the-clock watch for Mr Tay from Thursday to Saturday morning was finalised. Ten volunteers signed up for three-hour daytime or six-hour overnight shifts. NODA is a programme in which volunteers provide companionship to dying patients who have no or few family members or friends. They usually befriend patients weeks before the "active dying" phase - when the body begins its final process of breaking down - and take turns to sit by their bedside when death is near. So far, volunteers have done vigils for 41 patients in the hospice. The shortest lasted a few hours and the longest stretched up to five days. Mr Tay had oesophageal cancer and was admitted to Assisi Hospice on Sept 19 for palliative care. This cancer is mostly associated with risk factors such as smoking and alcohol consumption. Tumours had spread around his neck and lymph nodes, obstructing blood vessels. Chemotherapy and radiotherapy were no longer effective, so the hospice had been managing the symptoms with medication instead. Dr Vibha Prasad, Assisi's resident physician, said on Nov 2 that it was likely Mr Tay would "go very fast". That was the day the vigil started. Mr Tay had been restless before the first NODA volunteer arrived. Sitting up with his head bowed low, he rasped and gasped for breath, chest heaving. A general ward volunteer wanted to know if he needed oxygen but did not know what it was called in Mandarin. She googled and asked him hesitantly if he needed yang qi. Her husband laughed at her pronunciation and Mr Tay gave a wide grin, his shoulders shuddering as he laughed. It would be one of his last. The next moment, Mr Tay mumbled "Ah Mui", which the volunteers later deduced to be his sister. Then he called "Ah Jui" repeatedly, and waved his hand as if he saw someone. The volunteers were unperturbed. They had been trained to expect that the dying sometimes see people that others cannot. By 2pm, NODA volunteers Paul Koh, Lydia Tan, and Karen Sng, all 63, had turned up. Mr Koh, a former bank dealer, held Mr Tay's hands and played his favourite Hokkien and Mandarin songs. 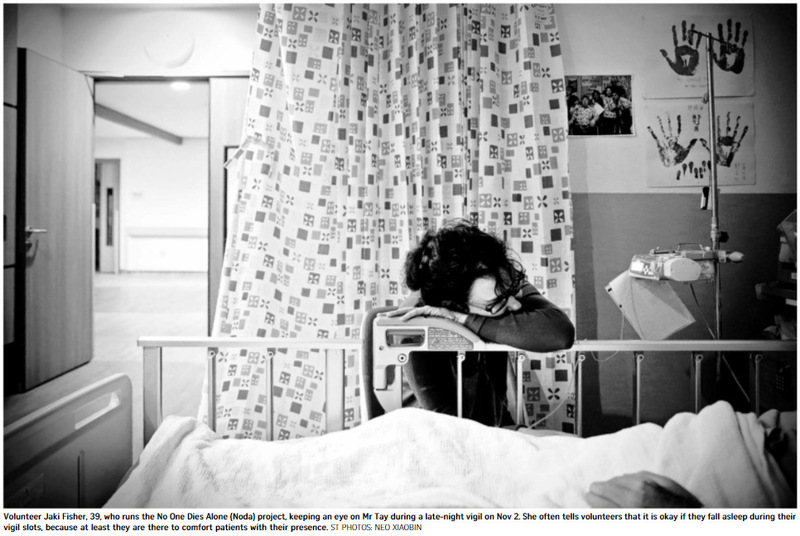 As the tunes wafted through the ward, Mr Tay bent his knees and waved his hands. Ms Sng and Ms Tan tapped their palms on his arms. A candle, an artificial plant and a laminated Kuan Yin image was placed on his bedside table, a shawl draped over it. These were placed in Mr Tay's line of sight to bring him comfort and peace. By 4.30pm, an oxygen mask was fitted on him. His eyes were closed, as if he had gone into a deep sleep. As the volunteers arrived for their shift, they would introduce themselves before sitting down. Ms Tan thought Buddhist chants would soothe him and searched her phone for them. Mr Tay saw himself as a nominal Buddhist or Taoist. Throughout the vigil, volunteers held his hands in different ways. Some held his whole hand, others interlocked fingers with his and a few pressed their palms on top of his. Yet the message they sought to convey was the same: You matter and we are here with you. At 5.30pm, Mr Tay's younger sister arrived from work for a visit. Another volunteer, Ms Juliana Chia, 44, showed up before his sister left at 7.30pm. With his sister's permission, she massaged Mr Tay's head and neck with an ointment balm. Volunteers Shirley Yap, 64, and Toh Qi, 30, also came by to see him though it was not their shift. At 10pm, Ms Fisher's shift began. She lit another electronic candle and hummed a Buddhist sutra. When her shift ended at 1am on Nov 3, she kissed his forehead and hands to say goodbye. Corporate trainer Daphne Lim, 45, arrived for the overnight shift. "It's important for someone to be with Mr Tay at every moment as this transition from life to death can be very scary and lonely," she said. Her father had died in hospital. Through the night, she sat by Mr Tay and counted his breaths as rain pelted down outside. Twice, he seemed agitated so she called in the nurse to change his diapers. When he had settled down, she took out her notebook to sketch him, contemplating his life and what he must have been feeling then. At 6am, Mr Koh arrived and the roster continued. Ms Tan, Ms Yap and Ms Chia came by again that day, as did four others. Ms Fisher took the overnight slot on the second night going into Saturday. By then, the weekend roster was ready but Mr Tay died at 8.30am on Saturday, Nov 4, under volunteer Angela Sho's watch. Who was Mr Tay Cheng Tian? The clock was ticking and Mr Tay Cheng Tian, 54, wanted to seize and savour every last minute of it. One of his last wishes was for a seafood meal in Chinatown. When volunteers took him there in a wheelchair one Saturday in October, he developed a craving for tempura prawns and the group hopped from restaurant to restaurant looking for it. They finally settled on a place, and Mr Tay tucked into prawn fritters, broccoli with scallops and bamboo clams accompanied by small sips of Baron beer. He used to chug a few bottles of beer at the coffee shop after his odd-job labours every day and had a room filled with beer paraphernalia - calendars with "beer girls" and trophies from drinking contests. Asked about his favourite foods, he listed laksa, pig intestines, lobster, roast duck, smelly tofu, char kway teow, satay bee hoon, laksa, fishball noodles and roti prata. In early October, volunteers and staff of Assisi Hospice organised a durian party for him. He requested Mao Shan Wang durians. "I wanted it because I had never tasted premium durians before," said Mr Tay, who polished off four seeds. He admitted that he had tried a lot of things, including drugs. He once took Ecstasy at a disco in Malaysia. Mr Tay also wanted to visit the casino as "people keep talking about it but I have never been there". He seemed invigorated once he entered the casino, a trip paid for by his sister. "He got out of the wheelchair and, like a boss, pushed it ahead of himself as he sauntered around to decide which counter to play at," said medical social worker Samantha Soh, 42. She and volunteers Jaki Fisher and Paul Koh took him there during the Mid-Autumn Festival. "It was like God saying he was special that day," said Ms Fisher, half joking. Mr Tay won about $1,900, winnings which he used to pay for the seafood meal with the volunteers. Mr Tay used to bet on horses and 4-D. It was over gambling debts that he fell out with his brother, 52, a driver. They last spoke two years ago at their mother's wake. Mr Tay's sister, a 51-year-old IT support staff, visited him once a week at the hospice. The bachelor had no other immediate family members. His father, a security guard, died in 2005. He grew up in a rented flat in Lengkok Bahru, dropped out of school in Primary 6 and joined Kim Keat Vocational Institute. He did odd jobs like transporting goods, laying telephone cables, carrying rice as well as painting. His happiest memories harked back to when he kept fishes and birds and caught spiders. He would go "spider fighting" at the Botanic Gardens. In the four-room flat in Choa Chu Kang where he used to live with his sister and her family, there is a tank filled with luohan fishes. At the hospice, his favourite part of the day was to smoke next to the koi pond. Mr Tay also loved song and dance. At his birthday party at the hospice on Oct 19, he danced to Cantopop singer Sally Yeh's Xiao Sa Zou Yi Hui (roughly translated to "walking gracefully through life"). The staff and volunteers danced and cheered him on as disco lights swirled around them. Mr Tay managed to stand on his swollen feet and danced for five minutes. He received his gifts - a card and stuffed tiger (his Chinese zodiac sign) - thanking his new friends for making time for him. 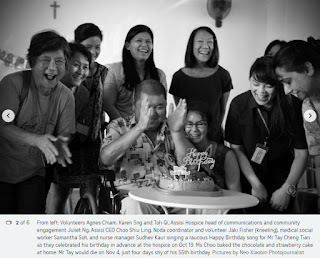 As he was fed mouthfuls of the birthday cake baked by Assisi's chief executive Choo Shiu Ling, he removed his spectacles to read the card. The party was then over. As if reminded that his time was running out, Mr Tay became broody and pensive, breaking away from the group for a smoke break outside. Earlier, he had asked if he could delay the celebration - a feeble attempt perhaps to stall for more time, time that had grown ever more precious as it ran out. Who wants to stare death in the face? Paul Koh, 63, has done vigils for more than 30 dying patients in the last three years. With his quiet and gentle demeanour, many find it easy to open up to him. Having seen so many people die, the father of two admits to feeling numbed. Yet an encounter with Mr Tay touched him deeply. Mr Koh helped Mr Tay put on diapers, change into a new set of clothes and pack fresh clothes to take to the hospice during a visit to Mr Tay's home in October. "When I asked him which underwear to take, what colour, how many, and then I combed his hair, he looked at me and there was sadness for both of us," he said. "It struck me that this was the last time he would be home," said Mr Koh, who shuttles daily between his volunteer work at Assisi Hospice and volunteer duties at hospitals. Why would a retired bank dealer want to spend his golden years checking on the diapers of patients, wiping their faces or holding the hands of the dying? This is all because big ideals such as quality of life and dignity in death start with small actions. "These are very small things but they help keep the patients comfortable and happy. One gap in the volunteerism scene nowadays is providing urgent companionship to those who are alone and dying," said Mr Koh. He recalled Madam Tan, a woman in her 70s who spoke dialect. She was very angry when she first came into the hospice and kept throwing things in her room. She did not want to die and fought hard against it. Mr Koh found out her likes and dislikes, as well as her concerns and worries. Slowly, she warmed up to him and spent her last days with him crooning her favourite song: Teresa Teng's Tian Mi Mi. She had family but only the volunteers sent her off at the crematorium. He said: "Seeing death so closely made me realise that life is fragile and time is short. I want to do what I can to help others now, because there may be no tomorrow to do it." It is not just older volunteers who feel the urgency of mortality. Dr Toh Qi, 30, also a No One Dies Alone (NODA) volunteer, came by to say goodbye to Mr Tay the night before she was due to go for a vacation. "As a doctor elsewhere, I treat people. But as a volunteer here, I hope to bring comfort by my presence," she said. Other NODA volunteers, such as Ms Shirley Yap, 64, and Madam Jeanette Wee, 63, had gone through a stressful time when their loved ones died. Ms Yap's mother was dying of a brain tumour and she was so afraid to leave her mother's bedside that she went without sleep for a few days in 2015. One night, her sister persuaded her to take a nap. Ms Yap slept for only slightly over an hour. When she awoke in the wee hours, she saw her sister and domestic helper fast asleep by her mother's bedside. Fear shot through her when she found her mother's body icy cold. She quickly woke everyone up and the family had five to 10 minutes to talk to their mother before she died. "If there was somebody else helping us to keep watch and ensure that we were there in her final moments, we would have been less anxious," said Ms Yap, a former therapy assistant. Madam Wee also had a traumatic experience when her mother died four years ago. The former kindergarten teacher decided to stop treatment for her mother's pneumonia and allow her to receive end-of-life care. A day after the treatment was ceased, her mum died. Madam Wee struggled with the guilt of letting her go. "It would have helped if there was an experienced person guiding me and telling me it's okay to let my mother go," she said. Madam Wee, Ms Yap, Mr Koh, Dr Toh and 40 other volunteers spent a weekend in October participating in a training workshop. Assisi Hospice flew in Mr Henry Fersko-Weiss - who started the first end-of-life doula programme in the United States in 2003 - to conduct a two-day workshop on how to be a "death doula" and help others die well. A more commonly used term is a "birth doula", who supports another woman during pregnancy as well as during and after the birth. The course covered aspects such as how to explore meaning for the dying, design rituals and the atmosphere at the vigil, and process grief. For instance, participants learnt that hearing is usually the last of all the senses to go, so they are encouraged to play soft music or talk to the dying person even if he is unresponsive or his eyes are closed. Volunteers also have to go through Assisi Hospice's in-house training. They are given tips on what to expect during a vigil. People from all walks of life took part in Mr Fersko-Weiss' session, from those in their 30s to an 82-year-old woman with mild dementia. Former banker Helen Lau, 55, shared during the workshop that she had arranged for a "near ideal" death experience for her husband when he died 12 years ago. She had got him to record his thoughts and wishes for his three children in a videotape and birthday dolls. Besides presenting him with a photo album, the children also made drawings for him. "In the last moments, the family sang hymns to him and when we got to the last word of a hymn, he took his last breath and that is how I know he is at peace," said Ms Lau. "So I am here to learn more because I see it as my calling to support others in having similarly meaningful death experiences." Now that Mr Tay Cheng Tian had had his last wishes like having a durian party, what else did he want? "How about a bottle of poison?" he asked, grinning. "I don't know," was the soft comeback. By then, Mr Tay had told the medical team that he had decided on a Do-Not-Resuscitate order. That meant that if his heart stopped or if he stopped breathing, the doctors would let him have a natural death. "Chang tong bu ru duan tong," he said, citing the Chinese saying on how it is better to quickly get the pain over with. Mr Tay had always insisted he was not afraid of death, but it was clear he continued to cling on to life and hope for a miracle. Fear and anger overcame him when he saw signs of his deterioration and impending mortality. Two weeks before his death, huge blisters appeared on his feet. He kept looking at his swollen hands and feet, muttering: "Gek sim (Hokkien for a hurting heart)." Desperate, he at times urged volunteers to take him to a traditional Chinese medicine physician, hoping for a cure. After seeing an advertisement on a nutritious brand of milk in the papers, he asked his sister to get a tin. But at the back of his mind, he knew the inevitable would come. When asked if he missed his parents, he said: "I should miss myself, it's my turn now to die. My mother died at 80, my father when he was 77. I am only in my 50s, I should have a good 10 more years." There were still many things he wanted to do, he said, like visiting China or Thailand, and seeing snow. If he could live his life differently, he would have chosen to do more charity work for the elderly. And why did he allow journalists to follow him around? "It's like an advertisement for myself and the volunteers," he said jokingly. "I often read in the papers about people dying alone in their flats and they are discovered only when their bodies rot. There is no dignity. I hope there will be more volunteers reaching out to these people just like there are volunteers who spend time with me here," he said. In his last days, Mr Tay did not pray much. He also did not have much contact with his relatives and had no desire to reconcile with his brother. There was only one thing he did not want to leave unsaid. "Mum, I do love you," said Mr Tay in Mandarin. "This is the first time I am saying it out loud. She always tells me if I don't talk to her, there will come a day when I won't have the chance to do so. Yet even at her funeral, no family member said anything and I didn't have the courage to speak up," he said, his voice soft but firm. "When I am dying, it is good to have more volunteers by my bedside. They play getai songs, also can," he added. He has already made a will to give his savings to his sister. She secured a niche for him at Nirvana Memorial Garden, where his parents' and uncle's urns are also housed. Towards the end of October, a staff nurse wheeled him downstairs for fresh air. When he returned, the bed next to his was empty. "Has he died?" Mr Tay asked medical social worker Samantha Soh. "Yes," she said. "Are you scared?" "No, like that lor," he replied, looking helplessly at his swollen limbs. The next day, he asked Ms Soh if they could buy four-leaf clover pendants sold near a temple to give to people at the hospice. But he was in no condition to go out by then. The next morning, two days before his death, he became agitated, crying out in Mandarin: "Da kai, da kai, wo yao xian zai zou (Open up, open up, I want to go now)." This could be symbolic language, commonly used by the dying, to signal knowledge of imminent death, said Ms Jaki Fisher, who runs the No One Dies Alone programme at Assisi Hospice. Thunder rumbled across the overcast sky as a group of people sat around a table in a funeral parlour in Sin Ming Drive for a wake. They were the only visitors that Saturday, apart from Mr Tay Cheng Tian's sister and her husband. The odd-job labourer had died that morning, Nov 4, aged 53. The entries in the bai jin (funeral contributions) book bore five names: three volunteers, one hospice staff member and a journalist. His brother-in-law spoke of his transformation in the last months of his life. "He used to be stubborn, quiet and had a temper. But in the two months at the hospice, he became much happier and chattier," he said in Mandarin. No One Dies Alone (NODA) volunteer and coordinator Jaki Fisher showed Mr Tay's sister photos of a recent cable car trip. The last time Mr Tay had been in one, he was in Primary 6 and the cable car stations had just started operating. She also had pictures of the disco party that volunteers had organised for his birthday in October, where everyone got in a line and danced, including Mr Tay. Tears came to volunteer Shirley Yap's eyes as she recounted how he had opened his to look at her while she held his hand during the previous day's vigil. Ms Fisher then reminded the others that a ritual of remembrance could help them find closure. For instance, she had taken a walk with her husband earlier that afternoon in memory of Mr Tay. As he had liked to gamble, she brought along a dice and asked the departed Mr Tay to guide their walk, rolling the dice at every street intersection. An odd number meant they turned left and an even one, right. The number shown would be the number of streets they would walk. She thought of him with each step. They started where they lived in Bedok North, walked through Opera Estate and strangely, were led back home. More volunteers gathered two days later for Mr Tay's cremation in Mandai. On the afternoon of Nov 6, 15 people including volunteers, hospice staff, family members and an old friend filed into a hall for a simple memorial service. His estranged younger brother came too. Some shed silent tears. Mourners hugged and comforted each other. Ms Fisher suggested a "closure meeting" in memory of Mr Tay. So they met at a cafe in a park in Yishun and ordered a tower of Singha beer, his favourite beverage. After a round of yam seng, with half a glass of beer in the middle of the table for Mr Tay, Ms Fisher asked the volunteers to close their eyes and think of the people they had journeyed with in the past month who had since died. As the sharing went on, the volunteers talked about how it pained them to see Mr Tay restless and struggling in the days before he died. It was clear that he had endeared himself to the volunteers and left a mark on their lives. Volunteer Lydia Tan said she was in so much inner turmoil witnessing his suffering that she went home after her vigil on his last Friday to pray, asking God why he had to suffer so much. She could not sleep that night and awoke with a heavy heart at 8am to write him a note. As she finished writing, the screen on her phone lit up with a message informing the volunteer group that Mr Tay had died. "I couldn't believe that he was connecting with me in that way," said Ms Tan. As the sun set that evening, Ms Fisher urged the volunteers to take a break and care for themselves. "This work is important for the world, but we need to take care of ourselves to keep doing it," she said. "It's a weird thing we are doing - give them all the love and they go. But they also become part of us and that is a measure of their legacy." In a confluence of lives, 20 dying residents at Assisi Hospice - including Mr Tay - received the love of strangers before they left the world this year, their presence a simple but profound gift. How wide, how long, how high and how deep can a person's love be for a dying stranger? The answer was one that surprised and moved my colleagues and me, when we followed a dying man in the final month of his life, to observe and document the difference volunteers can make to one's last days. Mr Tay Cheng Tian, 53, was a patient at the Assisi Hospice. Under its No One Dies Alone (NODA) programme, volunteers befriend patients who have few or no family members, keeping vigil round the clock at their bedside so they do not have to die alone. Mr Tay, who had oesophageal cancer, had been an odd-job worker, a bachelor with just two surviving family members - a brother from whom he was estranged and a sister, who visited him once a week at the hospice. The NODA volunteers stepped in, helping in simple ways, like wheeling him outside into the garden for a permitted smoke. They helped in bigger ways, generating the "re nao" (buzz and excitement) he was so fond of. They held a durian party for him, took him on a cable car ride and to the casino. He asked and was taken out to a seafood dinner. His birthday occasioned a disco party with dancing. They also became familiar with the close details of his life. Former bank dealer Paul Koh, 63, accompanied Mr Tay to his Choa Chu Kang flat on Oct 14. Knowing the visit would be Mr Tay's last, Mr Koh fought back emotions as he helped his friend pack fresh clothes for the hospice. Corporate trainer Daphne Lim, 45, and English teacher Jaki Fisher, 39, took overnight vigils, watching over Mr Tay from midnight to 6am, holding his hand when he was in pain, while rain poured outside. And it was speech therapist Angela Sho, 43, and clerk Madelina Ramamurutan, 66, who changed him out of his hospice clothes into his own after he died. The volunteers walked, literally, the last mile with him. As the undertaker wheeled his body out of the room, they went along, walking him up to the van to see him off. And they were there, a stalwart presence, at his wake and cremation. This choice to look death calmly in the face takes its toll and each volunteer has to process post-traumatic stress in his or her own way. Why do this week after week, death after death? Why put yourself so close to grief? For the healthcare professional, this is a gap that needs to be plugged. Ms Sho, a speech therapist with Assisi Hospice, says she and the nurses are often too busy to sit with the patients and be fully present at every moment. Yet, these are precious moments for their finality. Others have been shaped by personal experiences. Ms Lim's father had wanted to die at home but died in hospital as the family lacked the expertise to care for him. Former therapy assistant Shirley Yap, 64, had almost missed being by her mother's side when she died. Another retiree, former kindergarten teacher Jeanette Wee, 63, had battled guilt over stopping treatment for her dying mother. Others had gone through the peaceful death of a loved one, such as former banker Helen Lau, 55, and wanted others to die just as peacefully. Some could relate to the dying. Personal assistant Juliana Chia, 44, was no stranger to depression and had suicidal thoughts, and wanted to be there for those who were dying. Ms Fisher, too, suffered from loneliness during her teenage years and believes there are times in one's life - such as at birth or death - when one should not be alone. Singapore needs more volunteers like them. About half of the 82,600 households comprising only of residents aged 65 or older are made up of people who live alone, according to the General Household Survey released last year. By 2030, the Government estimates there will be 83,000 seniors who live alone. Said Associate Professor James Low, council member at the Singapore Hospice Council and senior consultant at Khoo Teck Puat Hospital: "One of the greatest fears of some of our elderly folk is to die alone at home and to be discovered days later in their flats by neighbours or passers-by." Humans are social beings and some sociologists say dying is a social and spiritual experience, rather than a medical condition or state. The isolation and loneliness near death can be more than just physical, said Prof Low, especially in the setting of an institution where one can still feel alone in the midst of many people in a busy ward. What I have learnt from the NODA volunteers is that one does not need special skills or to do much. The volunteers were comfortable with silence - as they held Mr Tay's hand, stroked him and monitored his breathing. Sometimes, they talked to him or played. What was most important was their calm presence. It was a gift from the heart which brought solace. Research shows the power of presence and physical touch. A 2006 US research paper, for instance, found that being present with people in comatose states near death has a positive effect on their heart rate variability, which is linked to emotional well-being. The strength of this programme also lies in its ability to impact the lives of the volunteers themselves. Many reported a renewed focus on how to live, in cultivating attitudes such as gratitude, humility, patience and empathy. One woman stopped buying Chanel handbags and another let go of the hurt and anger she had felt towards her former husband. A retiree went to her family members to say all she wanted to say to them. Most Singaporeans die in hospitals, though surveys have shown that most want to die at home. Having witnessed the astonishing gifts of the NODA programme, I feel it would be beneficial if more hospices and hospitals identified elderly patients who are isolated and matched them with volunteers. Assisi Hospice hopes to organise volunteers to be with patients at their homes in future. This would be more challenging than in a stay-in hospice, where volunteers have the support of trained nurses, said Ms Chee Wai Yee, who chairs the grief and bereavement workgroup at the Singapore Hospice Council. "It is not easy to recruit people who have an adequate level of emotional maturity and high level of commitment to be activated at short notice, given the general notion that death and dying are subjects to be avoided," she added. Prof Low suggested starting NODA programme partnerships with senior activity centres or daycare centres first, or using mobile applications or video conferencing systems to at least provide solitary elderly persons with a virtual presence. Volunteers can and do make a difference in reducing the grief of dying alone. Many people might not want to be involved, for fear they do not know what to do for the dying. The truth is, they would be doing it already, simply by being there.